Toot toot, All Aboard The Minivan Express! I was so excited when I found this idea for The Minivan Express! 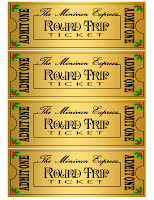 If you know me at all, you know that I ran right into photoshop and made up some Golden Tickets for the adventure! And you also know I have them here to share with you of course! I plan on going online and seeing where the best Christmas lights are in our area, then planning a little map so our nights not a bust! In a week or so when no one is expecting it, I will hide the “Golden Tickets” in my kids’ beds. My husband will start bed/bathtime as usual, while I prepare little bags of popcorn and possibly hot chocolate drinks and place them in their carseats, and make sure to have Christmas music playing in the van. When they go to climb into bed, they will find the ticket hidden under their covers, I’m hoping for lots of giggles and screams to see if everyone has a ticket! Upon entrance to The Minivan Express, we will hole punch the ticket (you know for effect and all.) Next, we’ll travel around the city looking at all the beautiful lights. We may even stop somewhere for a fun snack on the way home. What a fun Christmas tradition to start, I can’t wait! Since this idea was taken from The Polar Express, I thought I’d add a link for more teaching activities: The Polar Express. Also, a reader said that Barnes & Noble is doing The Polar Express story time this friday night December 4th at 7pm at most locations, visit yours to see times, but you could put the tickets in their beds early and plan on going there and then to lights too! Thanks for sharing your ideas! Fantastic idea! We love driving around and looking at lights. This is so cute. Now I just need a minivan! I also love this idea and think I will use your tickets for a special night for the kids. Thanks for sharing! Ya, sorry to all of you who don't own a van, maybe you can block out the 'Minivan' part and put in your vehicle name! Oh, hot chocolate when we get home is a GREAT idea, I was sitting here trying to figure out how to do that in the van w/o ME freaking out! LOL! Thanks!